Critically acclaimed as "one of the brightest new writers in the genre," (Publishers Weekly) Madeline Hunter has taken the world of historical romance by storm with her sensually powerful novels that feature strong heroines, provocative heroes, and timeless passion. Now this hugely talented author offers us a new tale filled with her trademark blend of danger, adventure, and sizzling seduction. The first time he laid eyes on her she had come to his rescue with a sword in her hand. Still Morvan Fitzwaryn had never seen any woman who aroused his interest and his passion more than the unconventional Breton warrior beauty. Anna de Leon took him into her castle and nursed him back to health, little knowing the spark of desire she was feeding with her caring ministrations. It wasn't long before Morvan had vowed to protect and conquer this unconquerable woman with all the sensual weapons at his disposal. For her part, Anna de Leon had no interest in men as lovers or husbands. She was used to commanding men in battle. But she suddenly had the strange feeling that her well-fortified defenses could be breached by this dark-eyed, smolderingly handsome English knight. When her castle is besieged by an old enemy who claims both her and her lands, Anna finds she has no choice but to accept Morvan's aid — even if the enemy outside her walls is no match for the ally within, who with every tantalizing kiss and forbidden embrace threatens to make her a prisoner of her own fiery passion. 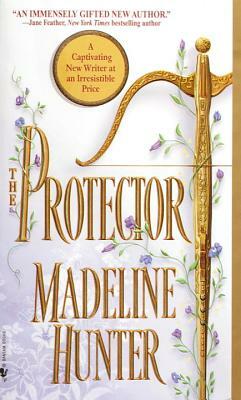 Madeline Hunter is a nationally bestselling author of historical romances who lives in Pennsylvania with her husband and two sons. In a parallel existence to the one she enjoys as a novelist, she has a Ph.D. in art history and teaches at an East Coast university.